‘On a touché au vers’. Stéphane Mallarmé’s famous 1894 remark could well be applied, with the necessary modifications, to visual artist David Mabb who, for some 15 years now, has ‘touché’, i.e. productively tampered with, the designs of William Morris. 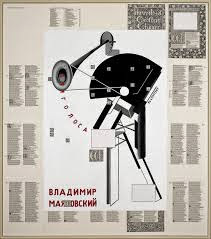 The typical Mabb artefact involves two elements: Morris’s floral late nineteenth-century imagery is boldly contrasted with the more aggressive, often geometrical iconography of the early twentieth-century Soviet avantgarde. The two modes of imagery, and by implication the two moments of socialism they represent, deeply unsettle each other, but without any possibility, on our part, of synthesising the two. Mabb’s new exhibition, 'Announcer' – which debuts at the Focal Point Gallery in my old hometown Southend-on-sea – could be seen as involving three elements rather than two. El Lissitsky images sit strikingly on top of often ornate pages from the Morris-Burne-Jones Kelmscott Chaucer – so far, so Mabbian – but the semantic content of Chaucer’s prose (if one leans in close to read it) means that thirteenth-century feudalism is also put into play alongside late-Victorian socialism and Soviet Communism. This three-way interaction is a step forward for Mabbian aesthetics, but still leaves the question of synthesis problematic. Mabb’s sleek, sophisticated images are visually stunning, no doubt about it, particularly in the sheer scale with which they confront you in the Southend gallery. 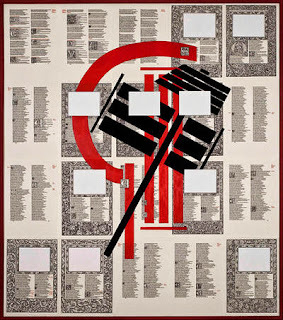 But why take this sustained detour through Morris and Constructivism rather than having a shot at an immediate contemporary political art of one’s own? Mabb marks out a space for the latter (the implication being that it will share aspects of both its predecessors without being reducible to either), but then does not deliver it. Is he thereby agreeing with Fredric Jameson, who in the 1980s used to argue that utopian representations had to be empty abstract schema because, in a postmodern image-culture, any positive content would at once be co-opted by the system, by consumer capitalism itself. Does this argument hold good today, do we still need to be as abstemious as that? After his 15 years of brilliant and thought-provoking montage – of clashing Morris and Constructivism together, and now Chaucer too – I wonder whether David Mabb might not take a risky next step towards a political art of his own, of our own. For certainly no-one’s contribution to an early twenty-first-century Communist aesthetics could be more important than his. It's worth noting that a brilliant analysis of David Mabb's earlier work is on its way from the subtlest of all Morris's recent commentators, Michelle Weinroth, in the book of the proceedings of the 2011 Morris symposium which she and Paul Leduc Browne organised in Ottawa. Hopefully the volume will be out later this year. The book is in production now, Tony. It will be in the autumn 2014 catalogue of McGill-Queen's University Press (www.mqup.ca) and we hope to have copies in our hands by October.